A firewall is a security system used to control network traffic going in and out of computers. Today we might take it for granted, however the firewall still remains one of the most important security devices in our systems. Historically, the Linux firewall par excellence has always been IPtables, however its rules are quite difficult to master. Thankfully all Ubuntu starting with 8.04 LTS include an easier to use, uncomplicated firewall: UFW. UFW is the default firewall for Ubuntu starting with version 8.04 LTS. UFW stands for Uncomplicated FireWall, as the name suggests it is simple to configure. Commands are intuitive and you even have a GUI, everything can be managed without a deep knowledge of networking (in contrast with firewallD which requires quite a bit of knowledge). Under the hood UFW interfaces with IPtables which does all the lifting. This means you don’t have to choose between them! Many people care about security but can’t write IPtables rules (they are pretty difficult). On the other hand, UFW simplifies IPtables management, but you won’t be able to harness the full potential of the underlying firewall without writing IPtables rules. In order for the firewall to work, you need to start UFW. You can do this using a simple command, however be careful: if you’re using a remote connection (e.g. SSH) you may lose your connection! This command will start UFW and will also ensure it is started on system startup. Notice that the command will also display a list of rules for the configured ports. Managing ports using UFW is quite straightforward, there is no need to know IPtables syntax and you can add/remove ports using one command. The changes are immediate, check twice before submitting a command! Hint: In place of PORT you may also use a friendly name if the service is common (e.g. ssh becomes port 22). Simply rewrite the rule you want to delete without ufw, and prefix ufw delete to that rule. Sometimes you may need further security (e.g. allowing only one IP address), that’s accomplished using advanced rules. In the following examples I will only show allow rules, but they are also valid if you want to deny addresses. This command will allow traffic coming from 192.168.0.3 to port 22/tcp. The tricky part is the “to any port” which roughly translates to “coming from any port to port 22“. You can also define a priority in place of on, priorities are: low, medium, high. Each priority changes the behavior of the logging module, if you just use the previous command the default logging setting is low. You will find the log in the /var/log/ufw.log file. UFW also has a GUI called gufw. Since UFW is already “uncomplicated” I suggest you to use the CLI instead, but if you insist in having a nice-to-use GUI, this section will guide you through the installation of gufw. The gufw package is available in almost every Ubuntu version (starting with 8.04 LTS) in the Universe repository. In order to install gufw you must enable the Universe repository. 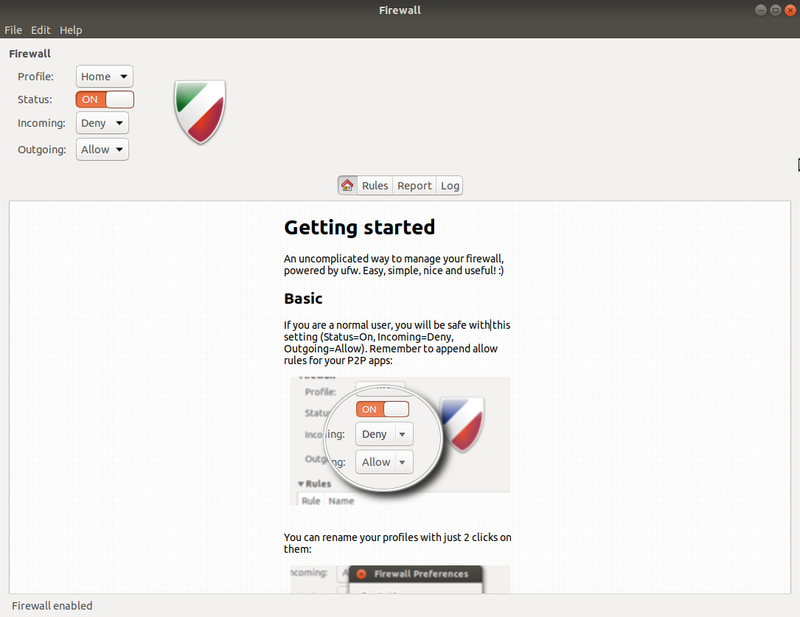 Done, you will find gufw installed in your system (under the name Firewall Configuration). There is not much to add since the program is pretty self-explanatory and there is even a short tutorial welcoming you. Next story FreeNAS 11.1 released, is FreeNAS back after Corral departure?